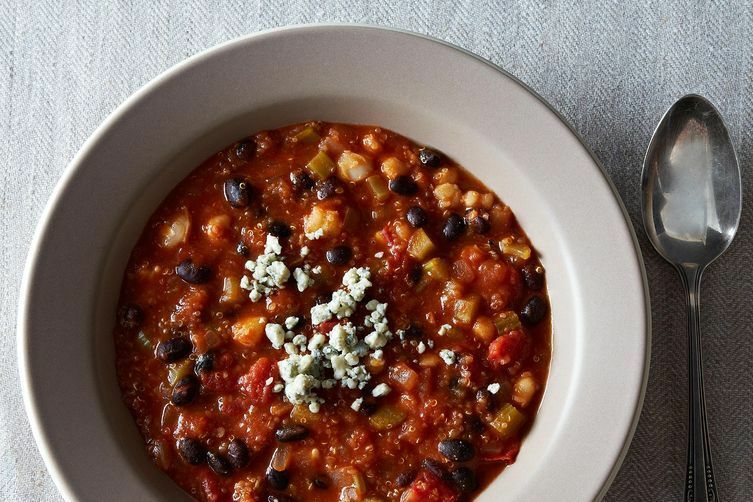 Today: Enjoy classic game day foods -- chili and beer -- while leaving the pigskin on the field. Today's the day of the year that's all about chicken wings, half-time shows, bacon-stuffed jalapeño poppers, stupid commericals, and dip-loaded tortilla chips. And football. Did we mention football? Vegetarians, don't you worry. This is your year to win the game. Maybe your friends will be eating short ribs, pigs in blankets, and sliders by the mouthful, but you're going to have something better (and less regrettable). With this menu you can enjoy classic game day foods -- chili and beer -- while leaving the pigskin on the field. After halftime, open up a bag of chips, whip up some guacamole, and turn dinner into a party. You probably have olive oil, smoked paprika, cumin, salt, and pepper in your pantry. If not, add those to the list, too. 1. Chill your beers in the fridge. No one (apart from college students) likes warm beer. 2. Dice the onion and the celery, then sauté in 1 tablespoon of olive oil over medium heat until soft, about 5 minutes. 3. Stir in the diced tomatoes, tomato sauce, and vegetable broth. Bring to a boil, then reduce to a simmer and cook for 15 minutes. Add the black beans, hominy, quinoa, Frank’s, salt, pepper, and 1 1/2 teaspoons each of smoked paprika and cumin. 4. Continue cooking for 15 minutes more, then ladle chili into oven-safe bowls, top with blue cheese, and broil for 3 to 5 minutes, until the cheese melts. 5. During halftime, after you’ve finished a bowl or two of chili, pour the beers into 4 large glasses. 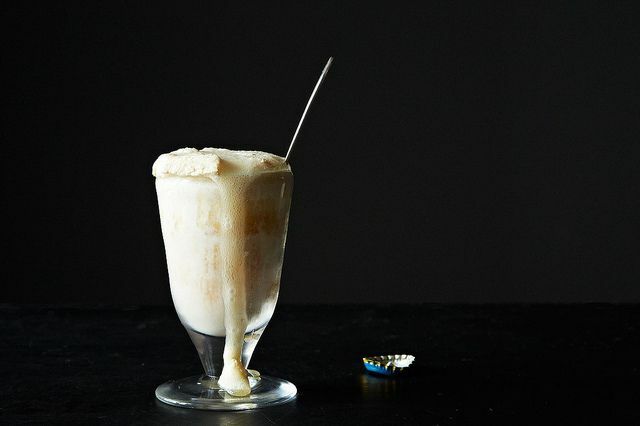 Add a scoop of your favorite ice cream and a straw. Break out the chips and dip and enjoy the rest of the game.